0959 Edgar, first King of All England, is crowned on Whit Sunday by Dunstan, Archbishop of Canterbury. 1083 Henry IV of Germany storms Rome, capturing St. Peter's Cathedral. 1098 After a five-month siege in the First Crusade, the Crusaders take Antioch. 1621 The Dutch West India Company receives a charter for New Netherlands, now known as New York. 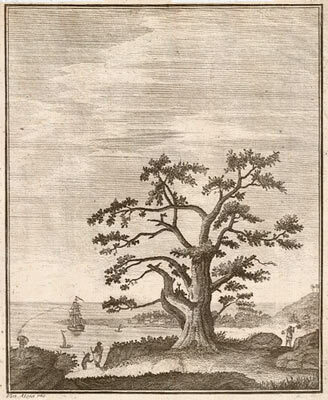 1769 At anchor in Matavia Bay, Tahiti, Captain James Cook observes the transit of Venus over the sun's disc, the main purpose of his epic voyage. "On Cook's first voyage, science ruled supreme, for the primary function of the voyage was to accurately observe a transit of Venus from Tahiti. Observations from there were thought to offer the most effective means of determining that basic celestial yardstick, the Astronomical Unit (or AU), which is the distance from the Earth to the Sun. Although the stated reason for the first voyage was to observe the 1769 transit of Venus, Cook's sealed orders revealed a secondary and, from a political perspective, even more important rationale: i.e. to search for (and if found to claim for Britain) the mooted Great Southern Continent. An ex-collier refurbished and renamed Endeavour was chosen for the voyage, as were two astronomers: Lieutenant James Cook and Charles Green. Cook, born 1728, was a career seaman with a solid background in nautical astronomy and coastal mapping. In 1766 he had observed a solar eclipse from Newfoundland. Green was six years Cook's junior and a former assistant at the Royal Observatory Greenwich. He had observed the 1761 transit of Venus, and in 1763 had taken Harrison's chronometer on a voyage of evaluation to Barbados. 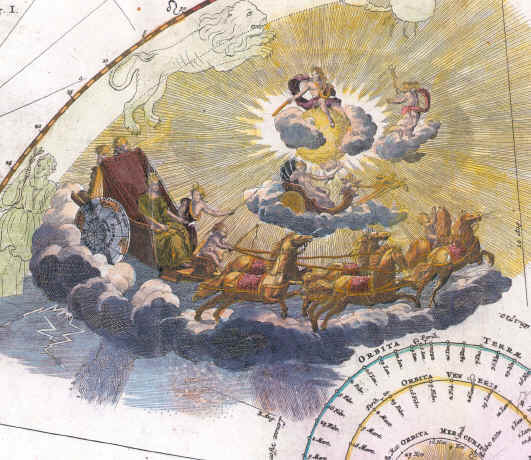 The Royal Society and the Royal Greenwich Observatory were careful to equip Cook and Green with the requisite scientific instruments, namely Gregorian reflecting telescopes; astronomical quadrants; sextants; astronomical, journeyman and alarum clocks; and pocket watches. The expedition reached Tahiti in good time for the transit which was scheduled for 3 June 1769, and a small fort was erected at Point Venus in order to guarantee that there would be no local interruptions on the all-important day. The astronomical clock made by Shelton and furnished with a gridiron pendulum was set up in the middle of one end of a large tent, in a frame made for the purpose at Greenwich. Without the end of the tent facing the clock, and 12 feet from it, stood the observatory, in which were set up the journey-man clock and astronomical quadrant: this last, made by Mr. Bird stood upon the head of a large cask fixed firm in the ground, and well filled with wet heavy sand. The Gregorian reflecting telescopes were to be used to observe the transit...Cook reported in his journal: "This day provided as favourable to our purpose as we could wish, not a cloud was to be seen the whole day and the Air was perfectly clear, so that we had every advantage we could desire in observing the whole of the passage of the Planet Venus over the sun's disk: we very distinctly saw an Atmosphere or dusky shade round the body of the Planet which very much disturbed the times of the Contacts particularly the two internal ones. Dr Solander observed as well as Mr Green and myself, and differ'd from one another in observing the times of the contacts much more than could be expected." 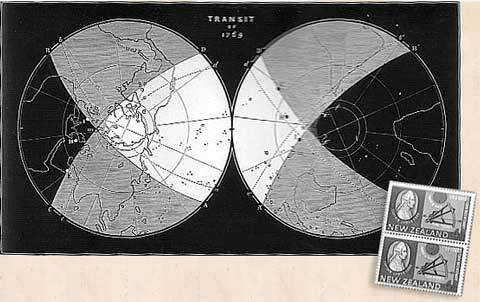 The transit lasted for about six hours, and was also observed at the other two stations. Observations were published in the Philosophical Transactions of the Royal society. The timings that were deemed critical were of the second ingress contact and the first egress contact. Both Cook and Green had problems in accurately establishing these. Cook explains the black-drop effect and its consequences thus: "Very difficult to judge precisely of the times that the internal contacts of the body of Venus happened, by reason of the darkness of the penumbra (i.e.. Atmosphere of Venus) at the sun's limb, it being there nearly, if not quite, as dark as the planet. At this time a faint light, much weaker than the rest appeared to converge towards the point of contact, but did not quite reach. The problem was to decide precisely when Venus broke free from the sun's limb." Even with these timing uncertainties, there is no justification for the claims that the Tahitian observations were a failure as they did indeed produce a meaningful value for the AU." 1770 Mission San Carlos Borromeo de Carmelo, also known as the Carmel Mission, is founded by Father Junipero Serra in the Monterey Bay but will later move to the Carmel Valley; the second mission founded in California. 1780 Birth: William Hone, author. 1800 US President John Adams moves to Washington DC; the first President to live in what will become the capital of the United States. It will not be until November, however, before he moves into The People's House or The Executive Mansion, later known as The White House. 1808 Birth: Jefferson Davis, in Christian County, Kentucky, the first and only president of the Confederate States of America. 1818 The last of the Maratha Wars between the British and the Maratha Confederacy in India ends, securing British supremacy in India. 1844 Birth: Garret A. Hobart. "The twenty-fourth Vice President of the United States. He was born in Long Branch, Monmouth County, New Jersey, and graduated from Rutgers College in 1863. He was admitted to the bar, and practiced in Paterson, New Jersey. Hobart served in the New Jersey state Assembly from 1872 to 1876, serving as speaker in 1874. He was a member of the state Senate from 1876 to 1882, serving as its president from 1881. He was nominated as the Republican candidate for Vice President on the ticket with William McKinley, and was elected in 1896, serving from March 4, 1897, until his death in Paterson, New Jersey. During his tenure as Vice President, his wife, Jennie Hobart, frequently performed the duties of First Lady." 1856 Cullen Whipple of Providence, Rhode Island, patents the screw machine. 1864 Birth: Ranson Olds, car maker (Oldsmobile) and truck (REO). 1871 The Obocock Bank in Corydon, Indiana, is relieved of the sum of $15,000 in cash by 24-year-old Jesse James and his gang of outlaws. 1904 Birth: Charles Richard Drew, physician; will develop the storage of blood plasma. 1915 WW1: Austrian-German armies retake Przemysl in Galicia. 1932 Weimar: President Hindenburg dissolves the Reichstag. 1934 Hitler holds a conference with SA leader Ernst Röhm (Roehm). 1934 Dr. Frederick Banting, co-discoverer of insulin, is knighted in Britain. 1937 The Duke of Windsor, who, as King Edward VIII, had abdicated the British throne six months before, weds Wallis Warfield Simpson in Monts, France, a twice-divorced American. The duke had been forced to give up the crown because his title prevented him from marrying a commoner and a divorcee. Edward VIII was the first British monarch to voluntarily abdicate the throne. 1939 Holocaust: June 3-4 The US government refuses to admit the 930 Jews on the S.S. St. Louis, even those with valid American quota numbers. All requests go unheeded as the ship sails northward along the Florida coast. 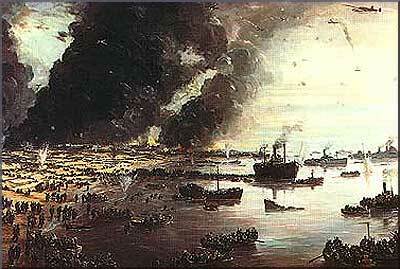 1940 WW2: The evacuation of allied troops from Dunkirk is completed. Over 335,000 British, French and Belgian troops are rescued. 1940 WW2: The German air force bombs Paris, killing 254 people, most of them civilians. Determined to wreck France's economy and military, reduce its population, and in short, cripple its morale as well as its ability to rally support for other occupied nations, the Germans bombs the French capital without regard to the fact that most of the victims are civilians, including schoolchildren. The bombing succeeds in provoking just the right amount of terror; France's minister of the interior can only keep government officials from fleeing Paris by threatening them with severe penalties. Despite the fact that the British Expeditionary Force is completing its evacuation at Dunkirk, and that France is on the verge of collapse to the German invaders, the British War Cabinet is informed that Norway's king, Haakon, has expressed complete confidence that the Allies will win in the end. The king, having made his prediction, then flees Norway for England, his own country now under German occupation. 1941 WW2: Statistics from a Gallup Poll show that 83% of the American people are against entering the war. 1942 WW2: An American patrol plane sights a Japanese force of 200 ships approaching Midway Island. B-17s from Midway unsuccessfully attack Admiral Kondo's group of heavy support ships. 1942 WW2: The Japanese launch an attack on the two westernmost Aleutian islands, Kiska and Attu; the only American soil to be occupied by the Japanese during WW2. The attack is an attempt to divert the Americans' attention from Midway. See June 4. 1944 WW2: Generals Giraud and de Gaulle reach agreement on the constitution of the French Committee of Liberation under their joint presidency. 1944 Holocaust: Another 496 Jews from Holland are transported to Auschwitz. 1946 The first bikini bathing suit is unveiled in Paris. 1946 Nuremberg War Crimes Trials: General Alfred Jodl, the Chief of the Armed Forces Operations Staff of the defeated Wehrmacht, begins his testimony. "...The Fuehrer informed us of events and occurrences at the beginning of the war - that is, the efforts of other countries to prevent this war, and even to put an end to it after it had already begun - only to the extent that these events were published in the press. He spoke to the politicians and to the Party quite otherwise than to the Wehrmacht; and to the SS differently again. The secrecy concerning the annihilation of the Jews, and the events in the concentration camps, was a masterpiece of secrecy. It was also a masterpiece of deception by Himmler, who showed us soldiers faked photographs about these things in particular, and told us stories about the gardens and plantations in Dachau, about the ghettos in Warsaw and Theresienstadt, which gave us the impression that they were highly humane establishments..."
1948 The 200-inch reflecting telescope at the Palomar Mountain Observatory in California is dedicated. 1959 The US Air Force Academy in Colorado Springs, Colorado holds its first graduation ceremonies. 1965 Gemini-IV: Astronaut Edward H. White becomes the first US astronaut to walk in space as he spends more than 30 minutes outside spacecraft Gemini-IV. The craft, launched the same day as the walk, has only two crew members: White and Commander James A. McDivitt. Gemini-IV's flight lasts for four days. Note: The story goes that White, upon knocking on the spacecraft's door to be readmitted, is asked by McDivitt, "Who's there? 1965 Death: Karl Oberg, Supreme Head of the SS and Police in occupied France from 1942 to 1945. Arrested by American military police in June 1945, Oberg was sentenced to death by courts in both Germany and France before being pardoned by French President Charles de Gaulle early in 1965. 1968 Pop artist Andy Warhol is shot and seriously wounded by Valerie Solanis, a struggling actress and self-styled militant feminist. The incident takes place in Warhol's New York film studio, known as The Factory. Solanis who had appeared briefly in one of Warhol's films, will later be judged not mentally competent to stand trial. Valerie Solanis is author of The SCUM Manifesto; SCUM standing for Society for Cutting Up Men. Valerie is the only member. 1970 Death: Haljmar Schacht, financial wizard of the Third Reich who was President of the Reichsbank until 1939 and Minister without Portfolio until January 1943. Schacht was acquitted at Nuremberg in 1946 despite protests by the Soviet judge. 1976 The US is presented with the oldest known copy of the Magna Carta. 1978 The Guinness Book of Records sets a record itself as it becomes the most stolen book from British libraries. 1979 Ixtoc I: The Ixtoc I exploratory well blows out in the Bay of Campeche off Ciudad del Carmen, Mexico. By the time the well is brought under control in 1980, an estimated 140 million gallons of oil will have spilled into the bay. The Ixtoc I is currently #2 on the all-time list of largest oil spills of all-time, eclipsed only by the deliberate release of oil, from many different sources, during the 1991 Gulf War. 1982 Israel's ambassador to London, Shlomo Argov, is shot and seriously wounded. 1983 Gordon Kahl, a militant tax protester wanted in the slayings of two US marshals in North Dakota, is killed in a gun battle with lawmen in Arkansas. 1985 An accord between Italy and the Vatican ends Roman Catholicism's position as 'sole religion of the Italian state'. 1989 Chinese army troops begin their sweep of Beijing to crush student-led pro-democracy demonstrations. 1989 Death: Ayatollah Ruhollah Khomeini, Iranian leader. 1990 Presidents Bush and Gorbachev wind up a superpower summit in the United States with agreement on a number of arms control and trade issues and commitments to trust and consultation, despite their discord over Lithuania and German unity. 1991 France signs the 1968 Nuclear Nonproliferation Treaty, which prohibits signatories from helping other countries to acquire nuclear weapons. 1992 UN Secretary-General Boutros Ghali opens the world's largest environmental summit in Rio de Janeiro, Brazil, with 178 nations taking part amid tight security. 1993 After reading her writings, President Clinton announces that he is withdrawing the nomination of University of Pennsylvania law professor Lani Guinier to head the civil rights division of the Justice Department, sparking sharp criticism from black civil rights leaders. 1994 North Korea's refusal to allow inspections of two of its nuclear power plants prompts the United States to ask the UN about new economic sanctions against Pyongyang. 1995 Bosnian Serb officials make contradictory statements about the whereabouts of an American pilot, a day after his Air Force jet is shot down. Bosnian Serb military sources claimed that the pilot, later identified as Captain Scott O'Grady, is in Bosnian Serb hands - a claim that will prove false. 1995 Defense ministers from NATO and European Union countries agree to set up a "rapid reaction force" to protect embattled UN peacekeeping troops from Bosnian Serb aggression. 1996 NATO foreign ministers back a path-breaking deal that boosts the role of European members within the Atlantic alliance. 1997 French Socialist Party leader Lionel Jospin becomes prime minister. 1999 Caving in to Russian and Western demands, Yugoslav President Slobodan Milosevic accepts a peace plan for Kosovo designed to end mass expulsions of ethnic Albanians and 11 weeks of NATO airstrikes. 2000 President Clinton and Russian President Putin meet in Moscow to discuss a wide range of subjects, but they are unable to agree on the proposed US missile defense system.